The James Webb Space Telescope, set to launch in late 2018, is the largest and most powerful space telescope ever built — and now it's time to make sure it'd survive the trip to space. The enormous James Webb Space Telescope (JWST) is undergoing extensive testing to prepare for its nearly million-mile journey through space. After it launches in late 2018, it will return groundbreaking images of distant planets, ancient galaxies and more. The JWST is the successor to the Hubble Space Telescope, and it will have about seven times the light-collecting area — while Hubble's the size of a school bus, the JWST stands about 3.5 stories tall, Straughn said. To get its 18 large mirrors into position, it will fold up like "space origami" on a European Ariane 5 rocket. Once in space, it would navigate to a point called Lagrange Point 2, a spot about four times farther than the moon from Earth in a direction opposite the sun, giving it a clear view of deep space. To make sure it'd survive the flight, Goddard personnel are running the telescope through intensive testing re-creating every hostile element of its trip. "We've just finished some really critical testing of the telescope," Straughn said. " The launch of a telescope is one of the most violent events that a telescope endures, so we shake the telescope to make sure it will endure the stresses of launch. We blast sound at it so it will endure the pressures that it experiences during launch." Engineers also test each component in cold chambers, to reflect the chill of outer space. 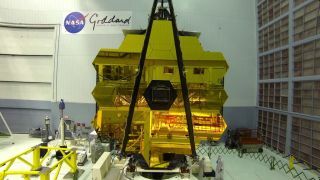 Once the environmental tests are complete, the JWST will be shipped to NASA's Johnson Space Center in Texas for optical testing in a vacuum and the cold, and then it will head to Northrop Grumman Aerospace Systems in California for its final assembly and testing, NASA officials said in a statement. Because of its extreme sensitivity, researchers anticipate collecting infrared light from some of the very first galaxies, and peering in on the atmospheres of far-away exoplanets, as well. In particular, many are excited about the newly discovered TRAPPIST-1 system, an ultracool red dwarf star with seven Earth-size planets in tight orbits. "We had this remarkable discovery just a few weeks ago of the TRAPPIST-1 planet system, and with Webb we want to go one step further," Straughn said. "Webb will be perfect for studying this planet system." "With Webb, what we'll do is we'll watch the starlight as it filters through the planets atmospheres, if they have atmospheres … [and] we'll be able to determine the chemical components of those atmospheres; things like water vapor and carbon dioxide and methane, things that would signal habitability," she said.